Raeyn April 14, 2019 April 14, 2019 No Comments on All Hail the Kid’s Section! We had popped into Tesco to buy a few clothing bits for the girls. Smaller specifically needed some new shoes, and she picked out several pairs of pretty things. I clocked these lovelies and opined that they don’t make cool things in my my sizes. 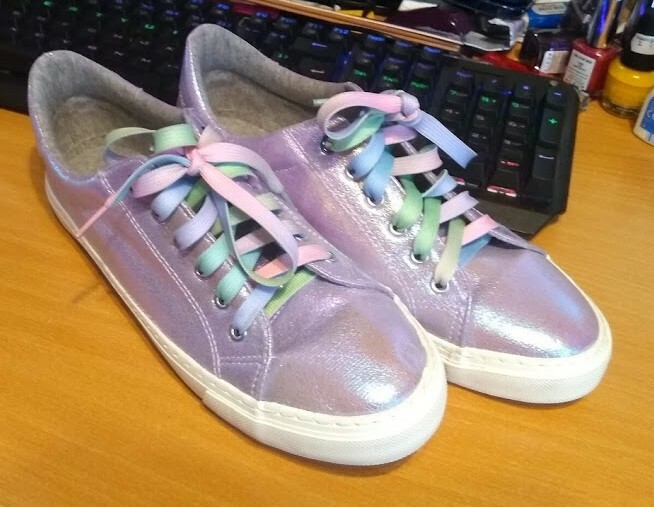 Turns out my feet are small enough for the high end of the kid’s section, so I made it out with some shiny new sneakers. Literally, shiny, glittery, purple, rainbow… perfection. We also ran into Z’s brother (ZB). We have little contact with him and his wife, because his wife has no interest in having contact with any of Z’s brother’s relatives. So it was a pleasant surprise that ZB stuck his head out to say hello, and that he introduce himself to the girls as their uncle. His wife said nothing to us when she saw the fam, looked at her watch meaningfully, and turned away. Yeah, she’s a bit of a piece of work, but never mind. At least Smalls remembered to wait until we were out of earshot before confirming that ZB’s wife disliked her nanny for no good reason. I guess that’s about it for now. I’mma go back to playing with yarn and gaming.